In the history of audio technology, few devices have evolved as fast as wireless speakers. The past few years have seen the wireless speakers bloom from novelty to almost-pervasive. But what are the things to consider when picking a wireless speaker? From the ages of speaker docks and boom boxes, wireless technology has transformed into a legion of audio devices that you can use to stream music from the comfort of your couch. While there has never been a more opportune moment to join the wireless wave, the ocean of available options can be quite confusing. 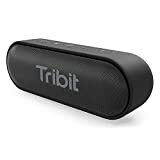 As such, you need to be careful with your selection so that you can filter out the noise and pinpoint the most suitable wireless speaker for you. But knowing what to consider when choosing a wireless speaker is easier said than done. You probably know that sound quality is important, but what else should you consider? Because a wireless speaker is mostly used outdoors where weather elements that can easily damage them, you might want to choose something that can withstand dust, wind, rain, and heat. The ability of a wireless speaker to withstand harsh conditions is usually indicated in the specs section, so be sure to check it. More importantly, check whether it’s completely waterproof or just splashproof. 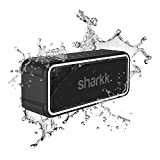 A true waterproof wireless speaker can withstand being fully immersed in water for some time (30 minutes for most speakers), while a splashproof speaker can only resist splash water. The choice here depends on where you will be using your wireless speaker most. 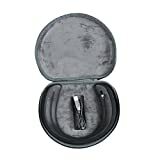 There are several worthy options for this like the rugged Fugoo Sport which is not only waterproof but also shockproof and snow-proof up to three feet for a period of 30 minutes. Even if you buy an all-weather speaker, be sure to protect it when in use to maximize its durability. The manufacturer may have designed it to be an all-weather device, but that doesn’t mean your speaker ’s audio drivers won’t be damaged by the little moisture that seeps through it. 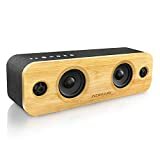 As it is with every other item, there are renowned and reliable manufacturers of wireless speakers and those that are in the industry to make quick money by selling substandard pieces. Therefore, you need to do your research before you settle on a particular brand. One of the best ways to do this is by reading consumer reviews of different brands. They will give you an idea of what to expect from a particular wireless speaker, enabling you to filter out substandard or fake options. Counterfeits and sub-standards aside, there are speaker sounds that are unique to certain brands. For example, Bose wireless speaker has a distinct punchy sound that you cannot find in any other brand out there. Klipsch speakers also have their distinct sound. Therefore, be sure to sample different brands in the store before you settle on a particular one. Wireless outdoor speakers are not just for music, they can also be used for aesthetic purposes like the stylish UE BOOM Wireless Speaker. It has a modern contemporary design that is best described as the epitome of ingenious detail-obsessed design. This spontaneous shape is perfect to bring to any occasion and still be stylish. You can improve the appeal of your home with the creative designs of wireless speakers. However, you need to choose a design that not only looks good but also blends into your home’s theme color. The good news is that the market is well-stocked with a wide array of creative designs, from speakers that look like tree stumps to others that seem to have originated from outer space. With so much to choose from, you will definitely find something that compliments your outdoor space. Quite often, you will want to move with your speaker from place to place. With this in mind, you might want to consider speakers that are small and lightweight. Additionally, you should also consider its performance and durability. Do not compromise on the sound quality just because of size considerations. If your choice does not meet these two standards, you should consider exploring more options. However, you can find speakers that are slim and incredibly light like the Soundmatters foxL DASH 7. It may measure only 3/4 inches in height, but it has 12 hours battery life and exceptional sound quality. 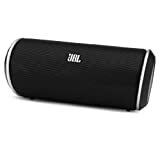 One great option as well is the JBL Charge 2. It is not only compact and perfect for traveling, but also has a 6,000mAh lithium-ion battery to charge mobile devices. Different genres of music require different types of speakers. Do you listen to music that has more bass effects or is your music more instrumental in nature? Do you love metal rock or hip-hop? Answering such a question will help you know what category of speakers you want, and this will save a lot of time. For instance, if you listen to instrumental music most of the time, you don’t need a low-frequency speaker as this kind of music barely hits low frequencies. If you’re into bass-heavy genres such as R&B, heavy metal, hip-hop or EDM, low-frequency speakers are the way to go. There are wireless speakers with Roar and TetraBass like the Creative Sound Blaster Roar 2. Roar and TetraBass boost bass levels at much lower volumes, without being overwhelming. The above considerations will only help you narrow down your options. You have the last word on picking a wireless speaker to buy. As long as your budget allows, buy what fits your needs and makes you happy. On the other hand, you don’t always need to spend a lot on a quality wireless speaker. On a hunt for the best Bluetooth speakers under 100 dollars? It is easy for most people since you don’t have to worry too much about durability. Anything is loud enough, and functional is acceptable. After all, you can easily replace it. But as soon as you cross the $50 mark, it starts to get tricky. You are spending a considerable amount of cash, and you sure want to get your money’s worth. The good news is that your choices are not limited to this amount of money. However, with so many brands and designs on the market, your shopping will be riddled with difficult choices. Lucky for you, we’ve done the heavy lifting, and compiled a list of the best Bluetooth speakers under 100 dollars. JBL boasts some of the best Bluetooth speakers in the $50-$100 price range, and the Flip 4 is no exception. It’s strikingly similar to the JBL Flip 3, only better. One of the new features of the Flip 4 is the IPX7 waterproof capability. It can stay submerged in a 3-feet water pool for 30 minutes and still function well. Although this isn’t something you’d want to test, it’s nice to know that you rescue your speaker if you accidentally drop it in the pool. Another cool addition to the Flip 4 is its ability to sync with up to 100 other speakers. This means you can crank up your music with multiple Flip 4s with no hitches whatsoever. Unfortunately, you can’t sync with previous models like the Flip 3. In terms of battery life, the Flip 4 lasts for 12 hours at 50% volume. If you play full blast, you will need to recharge it after 5 hours. If you're willing to go a little higher on price, you can always check out our review of the JBL Charge 2. Built in Bluetooth streaming and 5 hour battery life. JBL does it again with this little speaker that packs a punch. 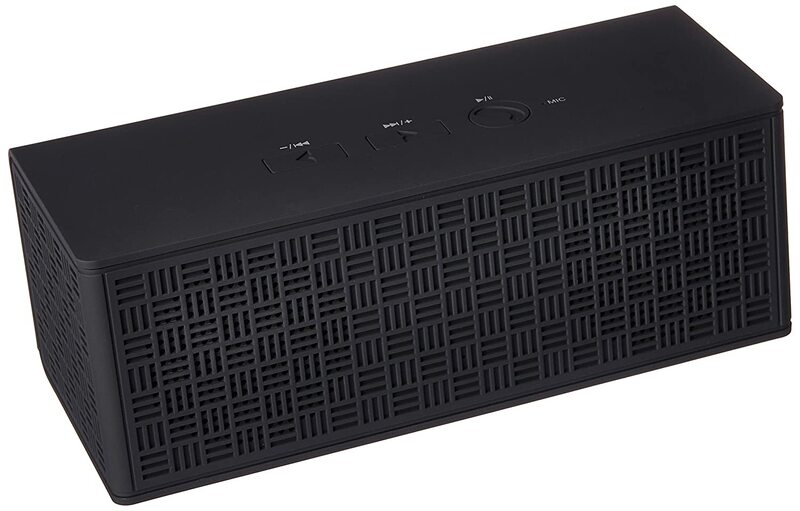 Next on our list of the best Bluetooth speakers under 100 dollars is the Archeer A320. It was initially going for $199, but now it's below the 100-dollar mark in most stores. It comes in a unique wooden design and can support a 15W subwoofer and two 5W speakers. The big Archeer A320 lives up to its huge first impression. It delivers a full frequency range while maintaining crisp, natural sound. It also offers some serious volume, thanks to its three-speaker entry. While it’s not the most portable Bluetooth speakers in the list, it offers the most robust music experience. It comes with a bag, too. The micro-USB charger might be an issue for some who prefers an AC adapter. 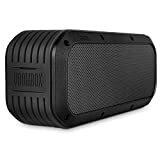 The Divoom Voombox is a 15W, omnidirectional speaker with a weather-resistant IPX44 rugged design. It comes with a 3600mAH Li-ion battery and the superb NFC pairing capability, guaranteeing you a long-lasting, high-quality audio output. In terms of design, the Voombox is long, tall, and heavy. 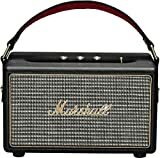 And unlike most portable plastic speakers, it is made of high-quality, sturdy metal. It’s also dust and waterproof, making it the perfect speaker for outdoor partying. NEW* An industry leading 6 drivers design, all fine-tuned by the Divoom audio engineer team. A powerful speaker with clean audio performance. Fits on our list of best Bluetooth speakers under 100 dollars. Coming just a little above the 50-dollar mark is the CB3 Armor XL. This Bluetooth speaker is all about durability. It can withstand the scorching sunlight, rain, dust, mud, and splash water. But that’s not all there is to the Armor XL. It also delivers great audio output despite its small size. It comes with a long-lasting battery, which allows you to enjoy your music for up to 10 hours when fully charged. For a speaker built to be durable, the Armor XL has impressive playback controls. You can answer, end, and mute calls as well as play the next/previous song, and adjust the volume with these controls. The only downside is that it doesn’t have the sleekest design you will come across, which is normal for a speaker of its price. The Sony SRS-XB2 comes in the shape of a pill and is available in red, black, or blue. It’s well known for its extra bass, making it a party favorite. This little Sony beat pill offers crisp and clear natural sound even at full volumes, without the tiniest bit of sound distortion. However, it can’t withstand harsh weather conditions such as rain or dust for a long time. But if you are more of an indoor person, it's a perfect way to enjoy quality music. Good quality speaker that packs good power with a booming bass. Thanks to these 5 options of the best Bluetooth speakers under 100 dollars, you don’t have to go break the bank to enjoy good music indoor or outdoors with friends. That doesn’t mean you can’t spend a fortune on high-end brands if you want to – that’s entirely up to you. But choosing a Bluetooth speaker definitely has its perks. But if all you want is a great speaker that won’t give you chills when you drop it accidentally or spill bear on it, then these great picks are the way to go. Good and affordable! 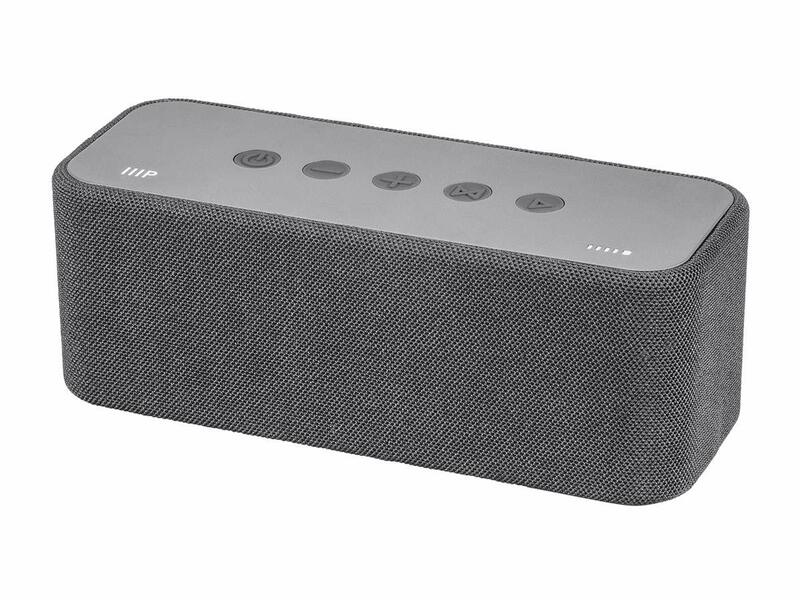 Finding Bluetooth speakers under 100 dollars sound good, but Monoprice, a company that sells different kinds of technology, has great, quality, with loud volume speakers that allow you to take it anywhere and which you can typically get at under $35. Speakers are becoming a bigger part of our everyday lives. Majority of people listen to music regardless of where they are- in the car, at home, in the gym. However, when we’re at home, or having a party, who in their right mind would use their headphones? Speakers are a wonderful technological invention that allow us to enjoy our music freely and loudly, without having to be restrained to using our tiny headphones. Monoprice is a big company that sells many different kinds of technology that can be used wherever like, computers, TV, and security system gadgets. One thing that they sell that probably makes them a lot of money is their speakers. They don’t just have one kind of speaker, they have many, so if you’re thinking about buying one, then you can definitely choose one that you prefer. This speaker is known to pack a lot of power despite its small size. With a 10-inch woofer and 1-inch titanium compression drivers, you won’t believe much noise this little speaker can make. From your backyard to a small venue, this portable speaker is a great choice that will your space with clear sound without getting in the way. The dedicated high- and low-frequency amplifiers mean that your music or audio will be crisp at all times, even down to 55Hz. 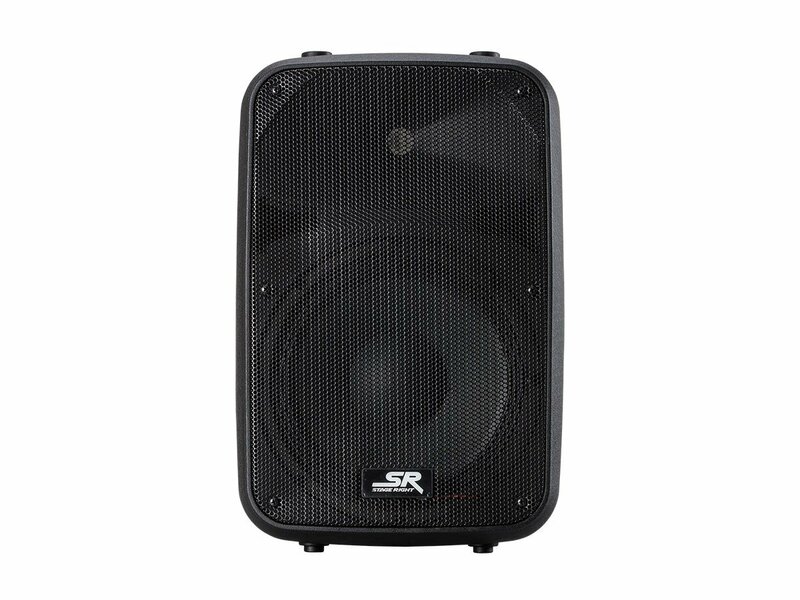 If you’re hosting an event, you can take advantage of this speaker’s built-in 2-channel mixer or even hook it up to an independent sound system for maximum control. For an even more immersive audio experience, hook up two of these speakers together. At just over 26 pounds, the 2-Way Active PA System can be stacked or easily mount on a pole. While this speaker doesn’t have many customer reviews yet, the ones it does have mention the impressive sound quality and solid construction at a surprisingly affordable price. What good is a portable speaker if you can’t enjoy it by the pool? With the Deep Blue Sub710 speaker from Monoprice, you can do just that. This waterproof speaker can survive full submersion for up to 30 minutes. With that kind of protection, a little splash isn’t going to do any harm. At less than 10 inches wide, this portable Bluetooth speaker is super easy to carry with you. It even comes with a carabiner for attaching to your backpack, belt, or elsewhere. From fishing to swimming, you can enjoy Bluetooth-connectivity from an impressive 65 feet away. For battery life, you can expect 8 to 10 hours per charge. Customers felt that the audio quality was impressive for the size of the speaker. However, one user experienced issues with their speaker’s drivers failing after just a short time. It’s unknown whether this was an isolated issue or not. Don’t be fooled by this portable speaker’s small size and sleek design. 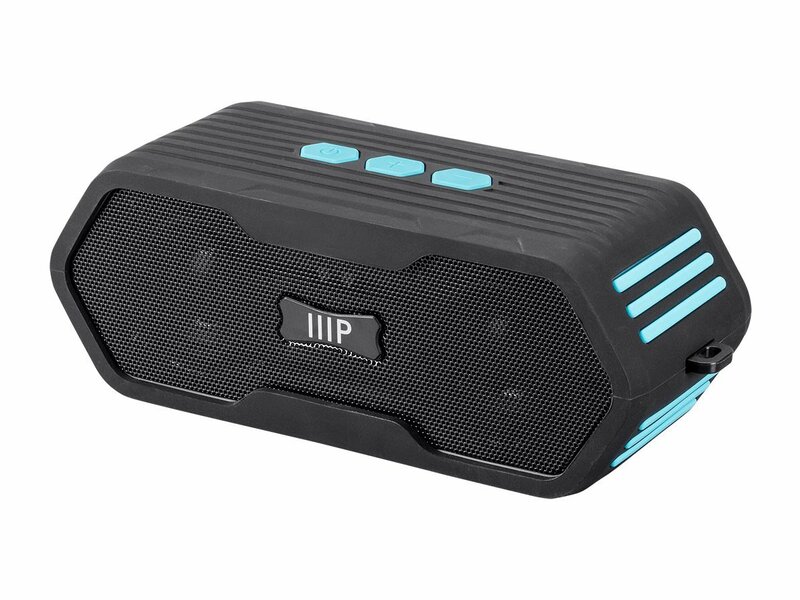 This little speaker packs over 30 Watts of power for enhanced bass and clear highs. The durable mesh exterior will ensure that your speaker stays in great condition no matter where you choose to listen to it. The Harmony XL has Bluetooth-connectivity that reaches up to 32 feet. With this feature, you can move around with your phone or other device without dropping the signal. From yard work to a game of frisbee, you can enjoy your music without missing a beat. If Bluetooth isn’t your style, you can use the standard auxiliary jack for wired listening. This speaker offers up to 15 hours of playtime per full charge. If you’re near an outlet, you can keep it plugged in so that it’s ready to grab and go as needed. As far as customer reviews go, most users enjoyed the size and audio quality of this speaker. However, some customers were disappointed with the audio quality overall. The Melody Bluetooth speaker from Monoprice is a stylish option for any home. 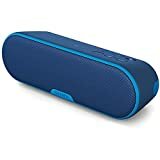 This portable speaker is great for those who want a portable speaker that looks and sounds great. With dual 2.5-inch drivers, this little speaker offers a powerful audio experience that you can take anywhere. 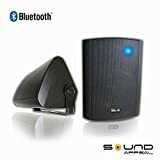 With Bluetooth-connectivity, you can connect your phone, tablet, computer, or other device within 32 feet of this speaker. You can even conveniently answer phone calls from this speaker, and get right back to your music or podcast when the call ends. This portable speaker has up to 15 hours of playtime per charge. Plus, you can use the USB connector to charge your smartphone or tablet (even when the speaker is playing). Customers loved how this speaker was portable, but not weak or “miniature” like a lot of popular Bluetooth speakers currently on the market.